Bhutan has some finest hotels and resorts in whole subcontinent, especially in the western part of the country. 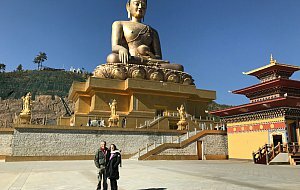 We will be happy to offer you custom-made program and quotation for your luxury tour to Bhutan. World-famous luxury chain which partnered with Bhutanese royal family members to built most luxurious and also the most costly resort available in Bhutan. 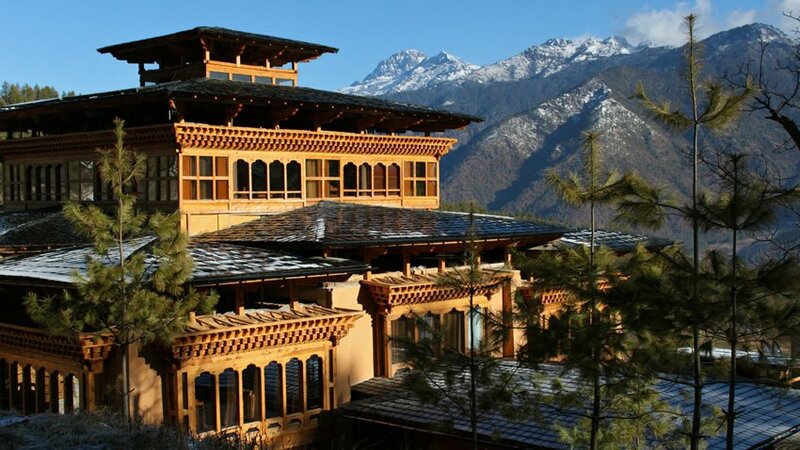 Six Senses is operating three hotels in Paro, Thimphu and Punakha, with another two, in Gangtey and Jakar to be open in the course of 2019. Cost of the stay is round 2000 USD per night for two people with full board. See more at Six Senses website. Well established and world-famous Aman resort chain has five properties in Bhutan, which belongs to the best resorts in Asia. You can experience Amankora luxury in Paro, Thimphu, Punakha, Gagntey and Jakar. Resort offers spa too and some original wellness treatments like "Forest bathing". Stay comes at rather premium cost of 1860 USD per night for double room with full board. See more at Amankora website. Two resorts, one in Paro and another in Punakha, are run by another famous international luxury brand Como. It provides professional hospitality in beautiful locations surrounded by forest on hilly slopes with breathtaking views of the landscape. Number of various spa treatments are offered too. Stay will cost comparatively reasonable 900 USD per night for double room with half board. See more at Uma by Como website. Located in pristine Neyphu valley isolated from the hustle and bustle of town but still in easy reach to both Paro and Thimphu this is another property opened in 2018, focusing on the top end guests. Definitely a place to give a try! One of the unique feature are the in-house traditional medicine doctors who do diagnostics and suggest treatments to the guest, service being included in the accommodation cost. Cost of the stay starts at 940 USD per night for two people with full board. See more at Bhutan Spirit Sanctuary website. Located in pristine Phobjikha valley with beautiful view of the landscape and just nearby to famous historical Gangtey gompa, this property is skillfully mixing traditional Bhutanese architecture with amenities of the modern resort. Cost of the stay is 1110 USD per night for double room with half board. See more at Gangtey Lodge website. Convenient location between Paro town and the hike to iconic Tiger's Nest starting point, excellent architecture respecting traditional Bhutanese style, large ambient rooms and spacious lobby. This all makes Zhiwa Ling Heritage in Paro special experience to stay. Recommended by National Geographic Unique Lodges of the World. Cost is acceptable 430 USD per night for double room with half board. See more at Zhiwa Ling Heritagel website. Hidden from the traffic ans hustle and bustle of the Thimphu city center this hotel located in the woods of Upper Motithang will attract those who need or want to stay in the capital, but prefer to sleep in the calm and clean environment. Building which skillfully mixes traditional Bhutanese and modern architecture features offers comfortable rooms along with outstanding dining space and bar at the hotel rooftop. Cost is quite reasonable 250 USD per night for double room with half board. See more at Zhiwa Ling Ascent website. 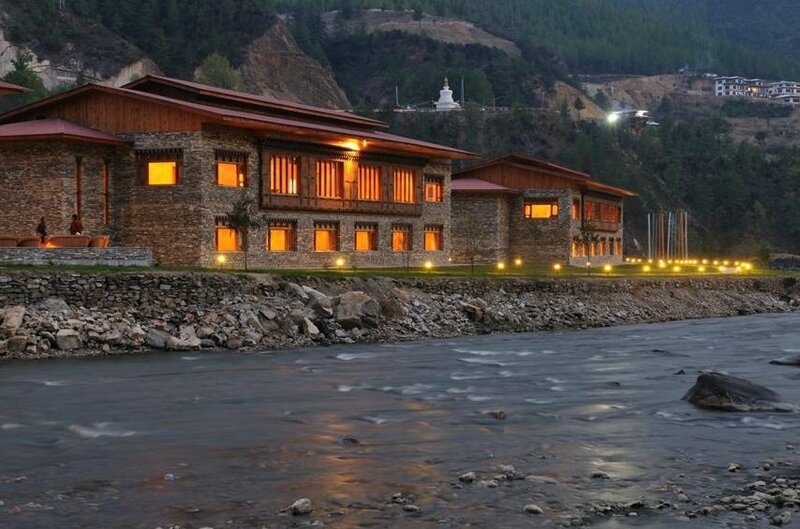 Excellent location by the bank of the river at the edge of Thimphu town, ambient rooms and nice surroundings are main strong points of this property, owned and managed by Queen Mother of Bhutan. Cost is reasonable 350 USD per double room with half board. See more at Terma Linca website. Huge room capacity, beautiful location at river bank with scenic walkway and dining terrace and lot of space makes this place ideal for bigger groups, conferences and events. 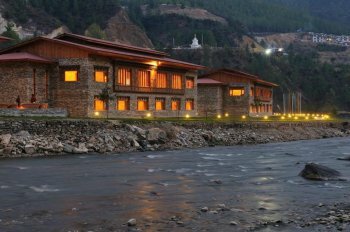 Convenient location nearby to the Paro airport and just one hour drive to Thimphu makes this hotel ideal base to reach sights of Paro and Thimphu without the need to change hotels. Cost is 540/480 USD per night for classic/deluxe double room with half board. See more at Le Meridien Riverfront website. Located high above the Punatsangchu valley nearby to the scenic nunnery, surrounded by pine grove, this property offers tranquility and beauty along with the comfortable rooms, excellent dining and spa. Cost is 430 USD per night for double room with half board. See more at Dhensa Boutique Resort website. Rated as 4* but definitely having 5* feeling, located out of the hustle and bustle of Paro town and offering breathtaking views of mountain including holy peak of Jomolhari (7326m), this place is obvious choice for everyone looking for calm place to relax and enjoy the stay in Bhutan. Various spa treatments are available too. Cost starts at 200 USD per night for double room with half board. See more at Naksel Boutique Hotel website. Located in calm neighborhood of Olakha, this modern hotel makes ideal base for your visit of Thimphu sights. It's interior design vastly surpasses other more expensive hotels in its simple beauty and uncompromising comfort. Cost is 120 USD per night for double room with half board. See more at Ariya Hotel website. Conveniently located at the heart of Thimphu on Clocktower square, this established property offers beautifully designed rooms in different color themes. Definitely the place to be in Thimphu if you want to enjoy luxury and town life. Cost is 180 USD per night for double room on bed and breakfast basis. Dinner can be included for extra 15 USD per person although in this case you might prefer to try many excellent restaurants in walking distance from the hotel. See more at Hotel Druk Thimphu website. Open in 2018 this centrally located property is nice addition to growing number of Thimphu's luxury options. You can select between the balcony and forest view rooms and various types of suites. Spa offers massages, steam bath, sauna and Bhutan's famous hot stone bath in luxury style. Cost starts at reasonable 185 USD per night for half board stay. See more at Norkhill Boutique & Spa website. Conveniently located just near to famous Chimmy lhakhang fertility temple, this upmarket establishment offer beautifully designed rooms and excellent service for reasonable fare. Cost is 200 USD per night for double room with half board. See more at RKPO Green Resort website. Please note that indicated prices might differ according to season, room category and other factors and are indicated here for rough comparison purpose only.